California's Camp Fire Becomes The Deadliest Wildfire In State History At least 48 people have died in the Northern California blaze that burned through the town of Paradise with shocking speed. 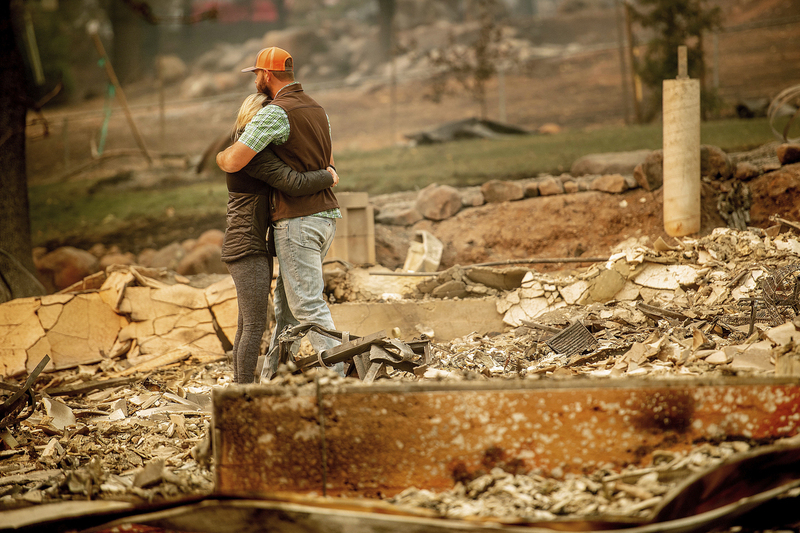 Chris and Nancy Brown embrace while searching through the remains of their home, leveled by the Camp Fire in Paradise, Calif.
Fire investigators in Northern California say they found the human remains of 6 more individuals, bringing the death toll to at least 48 people who have died in the wildfire that burned through the town of Paradise with shocking speed, making the Camp Fire the deadliest wildfire in state history. Fire crews are working to fight that blaze, along with another large wildfire in Southern California, where at least two deaths have been reported. A new, fast moving fire has also erupted in San Bernardino County, about 55 miles east of Los Angeles. Aerial footage from KABC television shows people fleeing the flames. Overall 50 people have perished in fires throughout the state. The Camp Fire in Butte County, about 80 miles north of Sacramento, has now burned 130,000 acres and is 35 percent contained, the California Department of Forestry and Fire Protection reported Tuesday night. 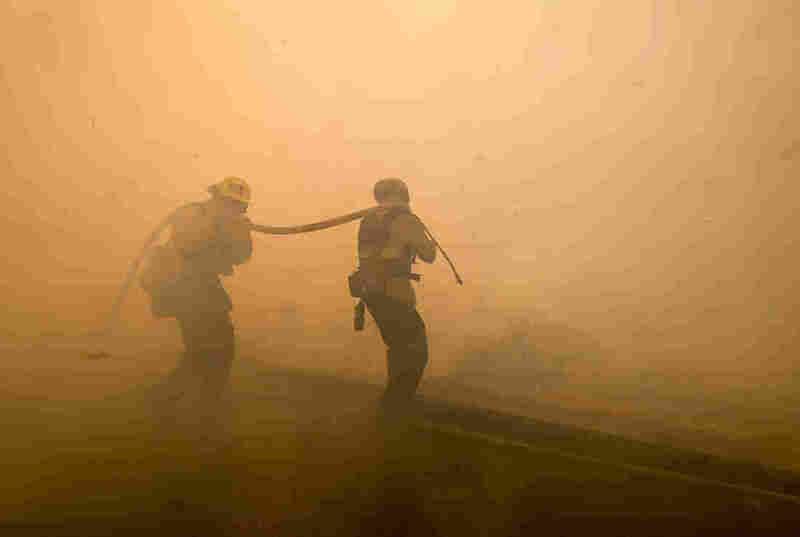 More than 5,600 personnel are fighting the blaze, which has destroyed more than 7,600 homes and 260 commercial buildings. An air tanker drops water on a fire along the Ronald Reagan Freeway in Simi Valley, Calif.
Butte County Sheriff Kory Honea said officials have requested 100 National Guard troops to help in the search for more human remains. "We want to be able to cover as much ground as quickly as we possibly can," said Honea, in the hopes that additional personnel could expedite the return of residents to their burned properties. "I want to tell you, though, this is a very, very difficult process and there is certainly the unfortunate possibility that even after we've searched an area ... it's possible that human remains can be found," he added. Honea also encouraged residents to notify the local district attorney's office if they believe they are victims of price gouging by anyone taking advantage of the disaster. He said he considered price gougers in the same category as looters. 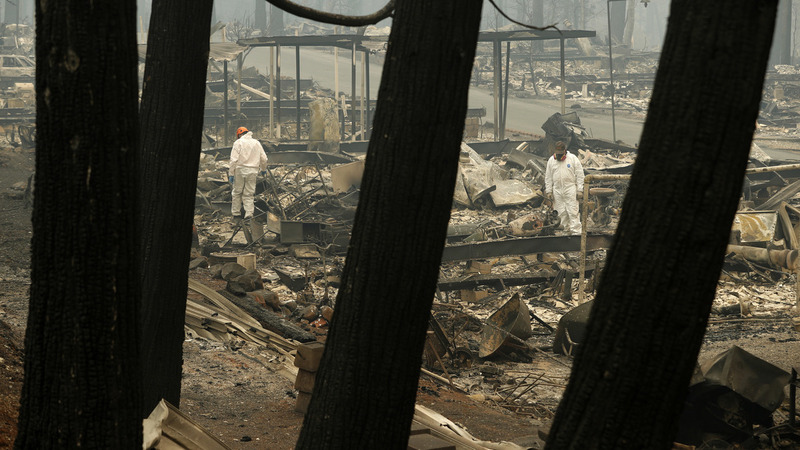 Workers search for human remains at a trailer park burned out by the Camp fire, Tuesday, in Paradise, Calif. The Camp Fire started last Thursday morning, growing explosively and forcing panicked evacuations. The fire stormed through Paradise, leaving behind near-total devastation. As of Monday night, nearly half of the evacuation centers in Chico, Oroville and nearby towns were at capacity. "Last night firefighters continued to hold established containment lines," Cal Fire said in an update earlier on Tuesday. The agency said firefighters had "worked aggressively" to protect structures in the fire's path, and that they've been working to build fire lines to establish control. But it added that dry conditions and steep terrain will continue to pose a challenge. Firefighters battle a fire along the Ronald Reagan Freeway in Simi Valley. 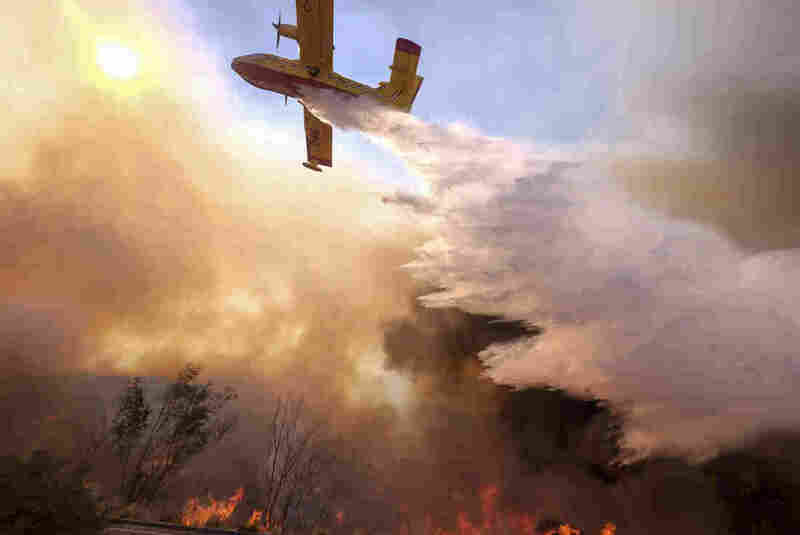 More than 50,000 people have fled the Camp blaze, according to member station KQED. And even at a distance, the fire is posing health concerns: "Air quality throughout the Bay Area remains in the 'unhealthy' zone, according to federal measurements," KQED reports, adding that the conditions should persist through Friday. To follow ongoing updates from fire and safety officials about the damage to specific areas in the Camp fire, Cal Fire has published a searchable map that includes photos of affected areas, as work crews inspect neighborhoods. Full information about evacuations and road closures is listed on the Cal Fire pages for the Camp fire and the Woolsey fire. To the south, the Woolsey Fire has burned 97,114 acres and is 40 percent contained, Cal Fire said Tuesday evening. The fire that broke out in the Thousand Oaks area — which had already been coping with a mass shooting — is blamed for two deaths. The Woolsey Fire is estimated to have destroyed 435 buildings. And according to Cal Fire, "83 percent of all National Parks Service land in the Santa Monica Mountains National Recreation Area has been burned by the Woolsey Fire." Firefighters are still primarily focused on protecting life and structures, citing "extreme fire behavior" from the blaze that has drawn power from Santa Ana winds. There are nearly 3,600 fire personnel fighting the Woolsey fire. The effort includes planes that scoop water from the ocean to drop on the flames — as a video posted to Twitter showed on Monday. President Trump has approved an expedited request for a disaster declaration for the California fires, saying he wanted "to respond quickly in order to alleviate some of the incredible suffering going on." Trump added in a tweet, "I am with you all the way. God Bless all of the victims and families affected." As for what caused the two deadly fires, that remains under investigation. As KQED has reported, two electric utility companies reported service problems just minutes before the Woolsey and Camp fires began. A spokeswoman for the California Public Utilities Commission tells the station that it will incorporate those reports into its investigation. In June, the California forestry agency blamed 12 wildfires on downed power lines owned by utility giant Pacific Gas and Electric. And in October, Southern California Edison said its equipment was at least in part to blame for the Thomas Fire that burned more than 280,000 acres in Ventura and Santa Barbara counties last year. The Camp Fire's death toll has grown in staggering leaps. The first notice came on Thursday, when investigators found the remains of five people in Paradise who were apparently trapped in their cars by the blaze. Four more were found on Friday, 20 more over the weekend and 13 more on Monday. Before the Camp fire struck, the most deadly wildfire in California's history was the Griffith Park blaze, which killed 29 people in Los Angeles in 1933. Last year's Tubbs Fire in Napa and Sonoma counties was blamed for killing 22 people.